You have the rewards of owning a business, without a lot of the risks. You make your own schedule and have the flexibility to take time off as needed. You have the opportunity to make residual income. You have the potential to build one of the best incomes in the industry. You have the opportunity to take a model we have created and profit from it. You have something that you can call your own. You can do all of this while avoiding all the expensive start up costs of running a business. Finally, you have the ability to give back by positively impacting the growth of your local community and the businesses within it. BirthdayPak is a proven, award-winning advertising platform that combines cooperative direct mail gift cards with online digital marketing techniques to provide upscale businesses, such as restaurants, salons, and jewelry stores with immediate, measurable, and sustainable results from their best potential customers living in their immediate community through the celebration of birthdays...a proven driver for consumer spending. 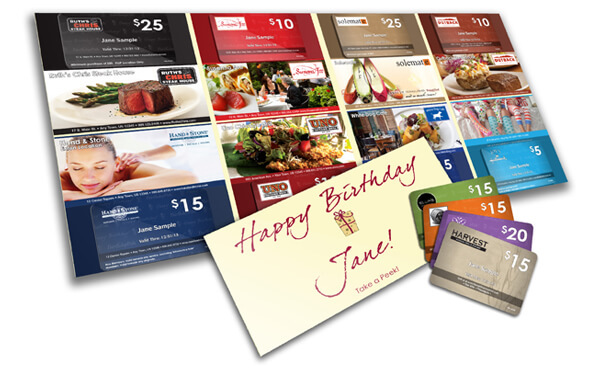 What makes BirthdayPak appealing to the recipient is the fact that offers are presented in the form of gift cards, not coupons...a game changer for sure! Connecting the best businesses in the community with their best customers at exactly the right time is what BirthdayPak is all about. 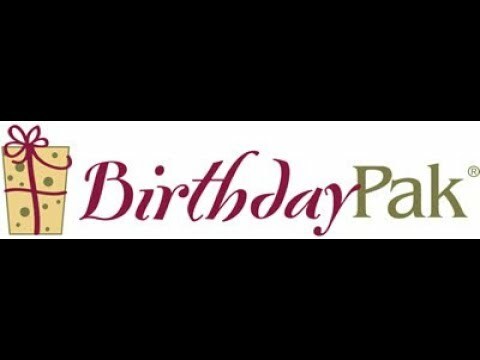 BirthdayPak recipients are then encouraged to activate their gift cards online, where they become a member of the BirthdayPak community, opening the door to multiple digital marketing opportunities, effectively turning BirthdayPak into a powerhouse multi-channel marketing platform. 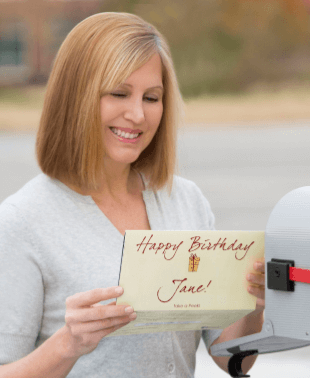 There is no other direct mail franchise on the market like BirthdayPak and territories are limited. Layout and design of the BirthdayPak. A custom CRM system that will help you track client communication and inventory. Print and digital presentation materials including email, business cards, media kits and samples – everything you’ll need to get started. Printing and distribution of your publication. Regularly scheduled individual and group calls, to help support and train you on the sales processes. This is also a way to connect with other franchisees facing similar successes and challenges. We have a well-trained and professional team that helps you in every aspect of your business. You will receive 3 days of in-person training at the corporate office and 3 days of in-person training in your area. Additional remote training is available on an ongoing basis. To be successful as a BirthdayPak franchise owner, you will need to be dedicated. The first year is all about building sales yourself and/or building your sales team. If your sales process is built properly when you begin, you will have more flexibility in the future. We are seeking entrepreneurs who share our passion and commitment to BirthdayPak and have proven to have good knowledge of the market. Previous experience with marketing, advertising, or sales is significant in order to successfully own a BirthdayPak franchise. We also look for interpersonal skills such as dedication, motivation and professionalism. Key attributes evolve around the ability to take advice and guidance from others.